Mom passed over at home after a challenging yet sacred time with our family beside her on October 8th and is orchestrating miracles from the other side for sure! With deep gratitude for all your love and support. As many of you know, we did not return to Rwanda this year so I could be with mom - now we return to Rwanda in January with amazing partners! 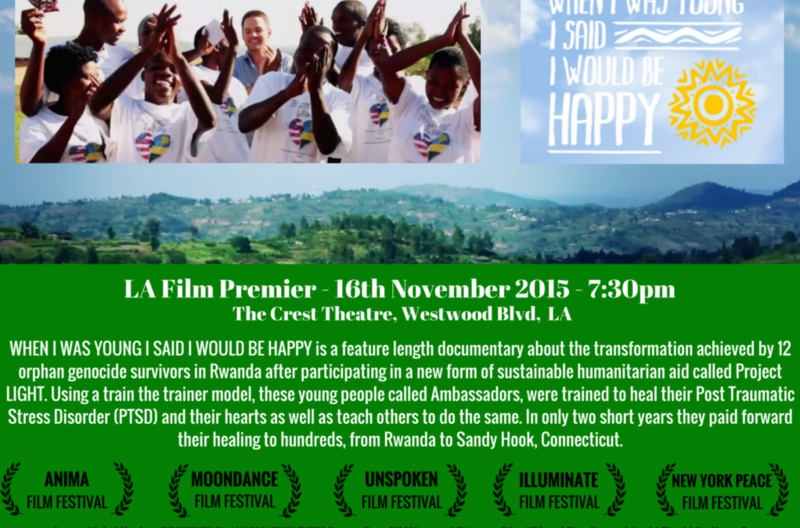 Nov. 16: LA Premier of our documentary at The Crest Theater on Monday, November 16th at 7:30 pm – again another miracle with thanks to Gabby Bernstein and Gina Bettencourt. Can you help get the word out? Click here for movie trailer. Anima Film Festival, Buenos Aires, Argentina – We were the lead film, we won the Audience Award in a hugely impressive film line-up and the US Embassy sponsored my trip as well as giving an opening reception in my honor….. Many more miracles to follow! Lori: I just watched the documentary! How amazing that you showed this in Argentina of all places! I was in Bolivia when thousands of young people were slaughted in Argentina, and that country has never recouperated. My husband, born in Bolivia, was studying Broadcasting in Argentina and had the sense to come home, only to go through 7 revolutions and being tortured 3 times for refusing to give the command to kill others in his own country! That’s why I have spent 10 years in the Phoenix inner city working with children who have been abused and neglected. I love the way you created empowerment! You closed the loop! For me: Dr.s have cautioned me to move out of trauma work, because it has taken it’s toll. My husband and I are now certified Life Coaches and are seeking a way to empower others through leadership training.